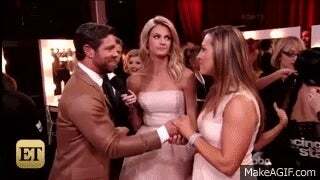 Monday night’s Dancing With the Stars semifinals featured a sweet proposal from contestant Noah Galloway to his girlfriend Jamie. Yes, it was an aw moment, congrats, yayyy... But the best part of it was Erin Andrews’ reaction, which was the epitome of ughhohhmygodyay! In reality, Andrews reacted in a reasonable way—with an equal mix of annoyance, shock and excitement for the couple. Kinda looks like she hated it, though. As typically happens when famous people make faces that could be “misconstrued” ;) Andrews cleared the whole thing up on Twitter.